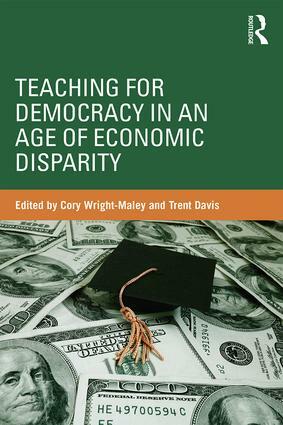 Teaching for Democracy in an Age of Economic Disparity addresses the intersections between democratic education and economic inequality in American society. Drawing upon well-established theoretical constructs in the literature on democratic citizenship as well as recent events, this volume outlines the ways in which students can not only be educated about democracy, but become actively engaged in the social issues of their time. The collection begins with an examination of how the confluence of capitalism and education have problematized the current model of democratic education, before transitioning into discussions of how teachers can confront economic disparity both economically and civically in the classroom. The authors then introduce a variety of ways in which teachers can engage and empower students’ civic action at all grade levels. As a final component, the volume explores new avenues for civic action, including the use of social media for democratic engagement in schools and opportunities for critical reflection and cross-cultural dialogue. This book is a valuable resource for both scholars interested in the research on democratic education and practicing teachers wishing to turn their students into critical, active citizens. Cory Wright-Maley is Assistant Professor of Education at St. Mary’s University, where he teaches elementary curriculum, instruction, and assessment, specializing in social studies education. Trent Davis is Associate Professor of Education at St. Mary’s University, where he teaches the philosophical and historical foundations of education.